It has been a while since I have posted some game photos here so it seemed a worthwhile venture to post a few photos of last Friday’s multiplayer game. Alas, it won’t be a full battle report as time and other commitments present such a luxury just now. Our normal Volley & Bayonet encounters are generally fictional with the scenario generated by the Road to Glory system. The most recent game was no exception. However, this time the scenario, set in 1809, found both the French and Austrian armies drawing very similar cards. Indeed, both armies would have somewhat over half their army initially on table and the remaining starting to arrive in the second or third turns. Remember that in Volley & Bayonet one turn represents an hour. The scenario would mean a very cautious game was to be played by both sides, each seeking a small but critical advantage that could be exploited, without taking too great a risk. The French, commanded by the flamboyant Marshal Murat, initially had secured rising ground on a plain flanked by streams several of which were marshy banked and were determined to hold this ground, rather than go on the offensive. This was especially so as Archduke Charles’ Austrian reinforcements began before the French. Archduke Charles army was had at his disposal III Armeekorps and comprised four divisions. Elements of II Armekorps, supported by a Reserve Cavalry Division would bring the Austrians to around 53,000 bayonets, 5,000 cavalry and 88 cannon. As Archduke Charles left the comfort of his headquarters located in the small town of Pitzelgraben early in the morning with high hopes of victory. His army was generally concentrated and he hoped that reports of the French concentrations were false. Therefore it was with some frustration that his initial advance on the left was soon dashed as French reinforcements began to arrive on to the battlefield. Likewise a more general attack on Murat’s centre was soon ruled out due to the strength of the French position. Above the Austrian left and centre. Above, the French left and extreme Austrian right. Below, elements of II Armeekorps move to the Austrian centre. Below, a view of the French line stretching from the centre to the French left. As elements of II Armeekorps deployed a slow but steady realignment of III Armeekorps to the Austrian right began. The aim was to apply pressure to the more exposed French left. But this alignment took time and the Austrian attacks only began late in the day and with only Vukassovich’s Division. After a short but fierce artillery barrage the ranks of white clad warriors marched forward their bayonets glistening in the Spring sun. Fighting was confused and bloody with both sides launching attack and counterattack. The fighting had become so critical that both Murat and Archduke Charles were seen inspiring their troops or leading attacks. Then, around 6pm, Murat suffered a significant wound and was taken from the field. The pendulum was again moving in favour of the Austrians. Above, the initial attack by Vukassovich’s Division against the French left. Austrian Hussars are held in reserve. In the distance French cavalry provide a reserve to the French infantry. By 7pm casualties in the French left began to weaken the troops resolve. Indeed as one French division looked likely to collapse Austrian Hussars were launched forward to create a what was hoped would be the critical breakthrough. Charles envisaged this being exploited by his other infantry divisions which had now been brought forward to reinforce the attack. However, the attacks by the Hussars, while generally successful, failed to deliver the hoped for breakthrough. French reserves again plugged the gap. Above, the Austrian prepare to exploit the situation. However, as darkness approached Archduke Charles ordered a halt. He would instead await for the arrival of more troops, meanwhile in the French camp the arrival of the Emperor bought renewed hope for the following day. The miniatures here are all in 6mm and by Heroics & Ros. The Austrians are from my own collection and the French from Jon’s collection. Trees are by Irregular Miniatures and other terrain generally homemade. Nice report Keith. A very enjoyable read. Thanks Greg. It’s good to move the miniatures around the table in what was an unusual game. I’m pleased to hear I have captured something of it in my description. 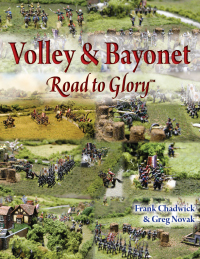 Enter your email address to follow The Volley & Bayonet Page.